It’s a church with a difference for the final entry in our Georgian series. Known as the “Cathedral of Methodism”, the Grade I-listed chapel on City Road in the Borough of Islington was first opened in 1778 just over the road from Bunhill Fields graveyard and remains in use today. 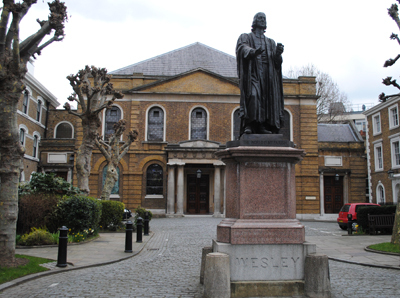 Methodism’s founder, John Wesley, had already established a London base in a former cannon foundry close by known as the Foundery when the fact the lease was expiring and plans for residential development of the area led him to look elsewhere for a headquarters for the Methodism movement (which he still then considered part of the Anglican Church). 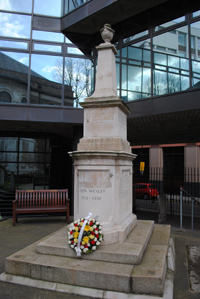 Wesley approached the City of London for a new site and, following a massive fundraising effort, in April, 1777, the building’s foundation stone was laid. The architect for the new building was George Dance the Younger, then surveyor to the City of London, and the builder, a local preacher named Samuel Tooth. The new chapel – which Wesley described as “perfectly neat, but not fine” – was opened on All Saints Day, 1778 – apparently Wesley spent the first 15 minutes of his sermon railing against the elaborate hats worn by female congregants. The chapel last underwent a major restoration in the 1970s after it was found to be unsound and was reopened in 1978 in the presence of Queen Elizabeth II and the Duke of Edinburgh exactly 200 years after Wesley first opened it. Inside the chapel – which features seats upon a gallery as well as the ground floor – features a ceiling said to have been the widest unsupported ceiling in England at the time it was built (the present one is a replica; the original had been damaged by fire in 1879). The original pillars used in the chapel to support the gallery were ship’s masts from the naval dockyard at Deptford given as a gift from King George III – these were replaced during the centenary commemoration of Wesley’s death with pillars of French jasper in 1891 but a couple of originals can still be seen in the vestibule. Memorials inside the chapel include those to John and Charles Wesley and early Methodists John Fletcher and Thomas Coke. Next to the chapel is the house Wesley lived in during the last 11 years of his life (this can be visited – and we’ll cover it in more detail in a later post) and underneath it in the crypt is the Museum of Methodism – well worth a visit in its own right. Wesley’s tomb (pictured) is located behind the east end of the church (accessed through the chapel) and outside the entrance to the chapel is a statue of Wesley. The grave of Susanna Wesley, mother of the Wesleys, can be found across the road in Bunhill Fields. WHERE: Wesley’s Chapel, 49 City Road (nearest Tube station Old Street and Moorgate); WHEN: 10am to 4pm Monday to Saturday (services Sunday – check website for details); COST: free but donations welcome; WEBSITE: www.wesleyschapel.org.uk.